This book is an engagingly told cultural historical narrative of the island nation of the Maldive Islands from the earliest references in Indian and European classics. It also narrates the story of the settlement by people from South India and Sri Lanka, and their later conversion to Islam. The second half of the book is an anthropological perspective of life as it was in the mid-1970s, with chapters on society, politics, religion and the economy. The change due to international influence in recent decades, especially in the capital Male, has been so vertiginous that many Maldivians are keen to understand what life was in their parents' time, when population was one-third of what it is today, the traditional fishing and lethargic cultural ethos that prevailed, and before modern education and international contacts had such an impact. People of the Maldive Islands is of more interest now as it was made unavailable during the thirty-year dictatorship of President Gayoom, before the democratic revolution of 2008. Many tourists, mostly Europeans, who visit every winter and stay on the little islands, also have an interest in the traditional culture. The Maldives has gained relevance in recent years because of present-day Islamic movements, trade relations with India, and more so because of the mortal threat of the rise of the ocean and acidification of coral islands. This was made famous by the then President Nasheed's plea on the international stage for reversing human causation of global warming. This book would be of interest to anthropologists, scholars of culture studies and Maldivians. Clarence Maloney was one of the first anthropologists doing fieldwork in the Maldives. At the time when he gathered the materials to write this book he was treading practically virgin ground. The Maldive Islands were beginning to open up to the outside world and tourism was making its first, timid steps. The time-honoured island way of life and the laid-back mood of the country didn't seem to be under threat from any outside force. 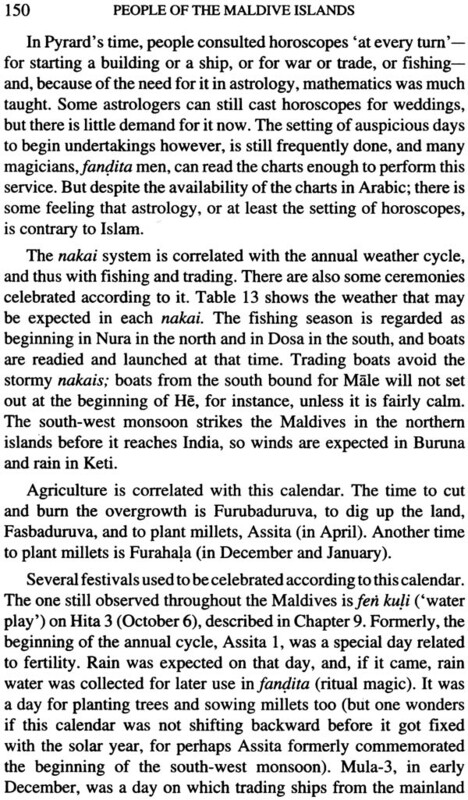 However, in the 1970s when he did research for this book People of the Maldive Islands, the Maldives society began to change. Tourism and its associated infrastructure brought about unprecedented activity in their wake. The influence of economic development reached every corner of the country. The construction industry boomed and the hitherto somewhat sleepy islands were thrown into a vortex of modernisation. 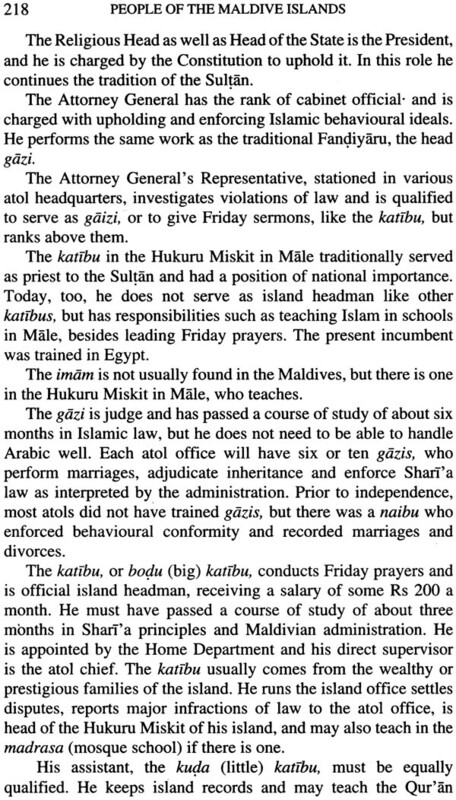 On the other hand, the Maldives was ruled by an ambitious young President who had completed religious studies in Egypt. Bidding farewell to former President Ibrahim Nasir's pragmatic rule, Maumoon Abdul Gayyoom, the new president, had a vision for the implementation of a thoroughly religious state. 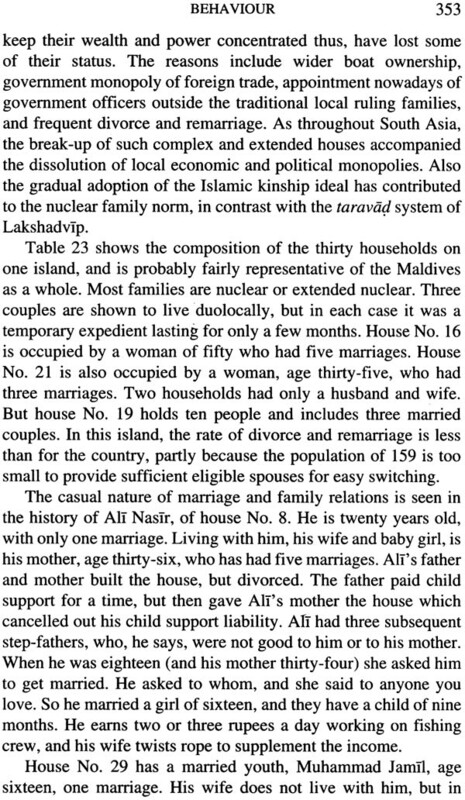 Gayyoom's militant policies and the expansion of religious education through modem schools were at odds with the traditional Muslim ways that prevailed in the Maldives prior to 1978. The ancestral wisdom and forbearance that kept islanders united as members of a family would give way to the use of religion as a political tool creating divisions in the social fabric. Finally, the role of the religion in society would change in such a fashion that it would become unrecognizable. The resilience of the Maldivian traditions was only apparent. 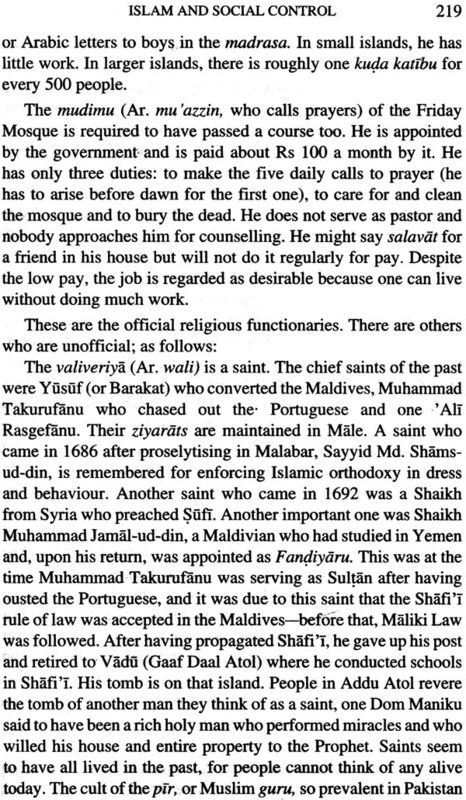 After being first neglected and then cornered by the new militant religious ways on one side and the modem technological world on the other, "Old Maldives", the society that Clarence Maloney presented in his book, ended up disappearing in a matter of a few decades. By the beginning of the twenty-first century, the country Maloney had so carefully described had been replaced by new ways and by different perceptions. Therefore People of the Maldive Islands is a book of exceptional value for it gives a glimpse into the ancestral island world. Its text and photographs usher us into the history and the reality of a mellower and less complicated existence and into a society that was whole, less wasteful, and full of ancient wisdom. The book is not only useful for those with an interest in history who want to study the vanished ways of a society that has irreversibly changed, it is also essential for all who wish to know how previous generations coped with daily life on the Maldive Islands. 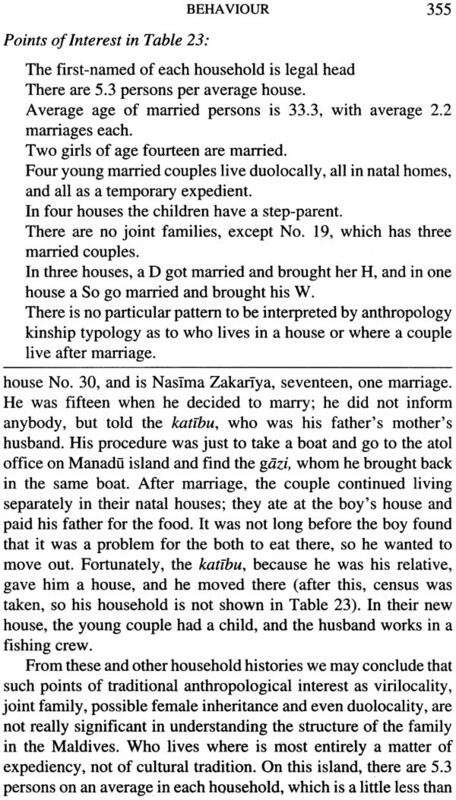 People of the Maldive Islands was the first detailed modem book of anthropology and culture history of the Maldives people. The first half is about origins and culture history and is still essentially valid. The second half describes life in 1975 when I did most of the research, but by now at least in the more populous islands life has changed so much that this part of the book is rather a narrative of how things were before such heavy world cultural and economic influence. But in the more remote tiny islands events move slowly and people still sit outside in their sagging coir-rope chairs in silent mutual understanding, interrupted by occasional lethargic conversations. 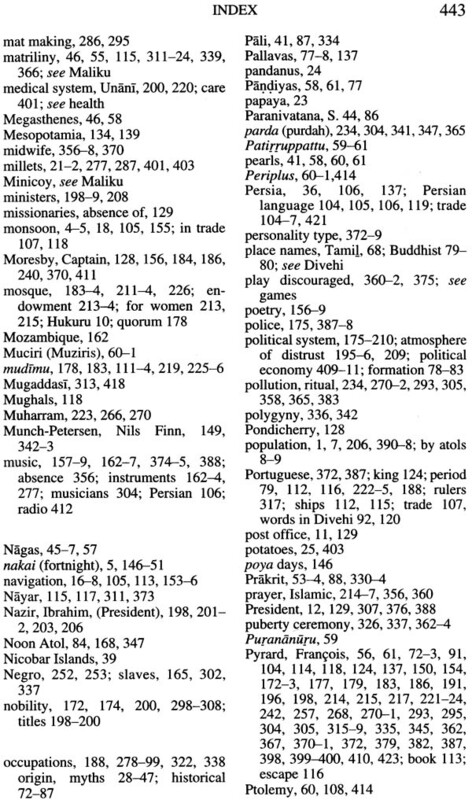 The book was banned under the authoritarian rule of President Gayyoom who ruled from 1978 until 2008 as it has chapters on religion and politics, also because the culture history narrative was in some aspects at variance with oral culture history. The manager of one of the tourist islands where many Europeans come in the winter had ordered a shipment of the book to give free to his tourist guests, but it was confiscated on arrival. The book has been long out of print and many people, especially Maldivians, have written to me enquiring how to get copies. Mohamed Nasheed, popularly elected as President in November 2008 and who promoted democracy, was forced to resign by a coup on 7 February 2012. He wrote a short Foreword to this edition, as he had written me earlier that he had read the book "many times." He is also a historian of recent events there (see Supplementary Bibliography at the end). Nasheed's Foreword briefly mentions the contrast between the earlier authoritarian rule under which he had been imprisoned many years, and the democratic society which he publicly idealised since his election as President. He became a world advocate on the issue of global warming and rising ocean levels, as the average elevation of those coral atols is only 1.5m above sea level; it is also distressing to contemplate the effects of ocean acidification on the coral environment and shellfish, as the main economic product has traditionally been fish. Nasheed's Government in March 2009 set an extremely ambitious goal that the country's energy generation would be largely carbon-neutral by 2020, relying 60 per cent on solar power, also wind. But President Nasheed and his democratically elected government were overthrown at gun-point by former President Gayyoom' s supporters, who ransacked the Museum and smashed most of the Buddhist relics, calling them idols, and destroying most of the ancient exhibits there, saying that for centuries Maldives has been and must continue to be 100 per cent Muslim. These people are said to have been influenced by radical elements trained in Pakistan. This new government, following attempts at mediation by India, has promised elections, but we cannot predict whether or not the special interests (such as the tourist industry) will prevail. Since research was done for this book, the change in Maldives society has been profound, in one generation, and as rapid as anywhere in the world. In 1977 the population was 139,000 but has increased to nearly 400,000 in 2012, with life expectancy at birth now 75. The capital Male had 20,000 persons when I was there, and now it has over 103,000 squeezed onto a little island of less than 2 sq km. 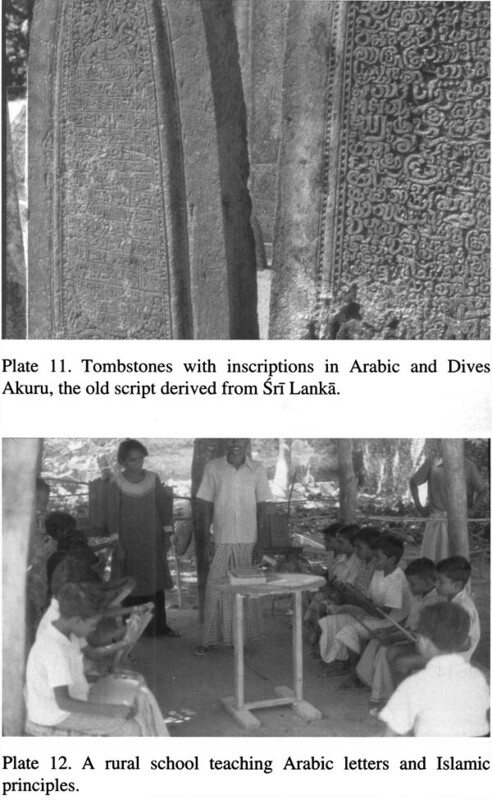 Literacy is practically 100 per cent; modern education has been available since the early 1970s, with many good teachers from Sri Lanka, so there continues to be sharp divided opinion on the official and legal role of Islam which some consider to be oppressive. Now over 90 islands are given over to tourism (which are otherwise classified as "uninhabited,") and more are planned; these attract some 800,000 persons a year, mostly Europeans during their winter. The main sources of income used to be fishing products, coconuts and coir, and trade in minor duty-free items, but now it is tourism, and because taxes are few the government runs in large financial deficit. So there is no way I could do justice to all this change by writing a new version of the book-also because then I was a professor interested in social research but have spent the last thirty-eight years in internationally funded development projects in South Asian countries. 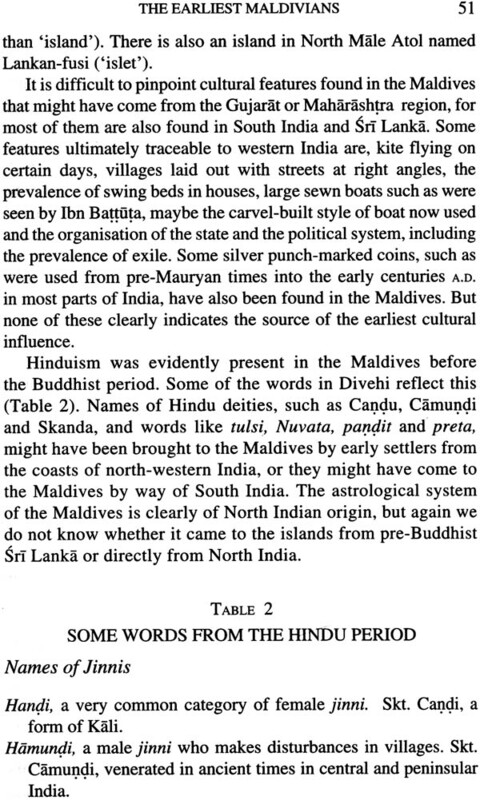 I went to the Maldives first in 1974 as I saw it as an extension of the South Asian and particularly South Indian history and society which was my professional academic interest. I had grown up in Tamil Nadu, South India, in a missionary family, attended Kodaikanal International School there, and subsequently earned my PhD in South Asian Regional Studies at the University of Pennsylvania. The topic of my Dissertation was "The Effect of Early Sea Traffic on the Development of Civilization in South India," which emphasised the scope of sea traffic in the Indian Ocean in the centuries before and during the early Present Era. 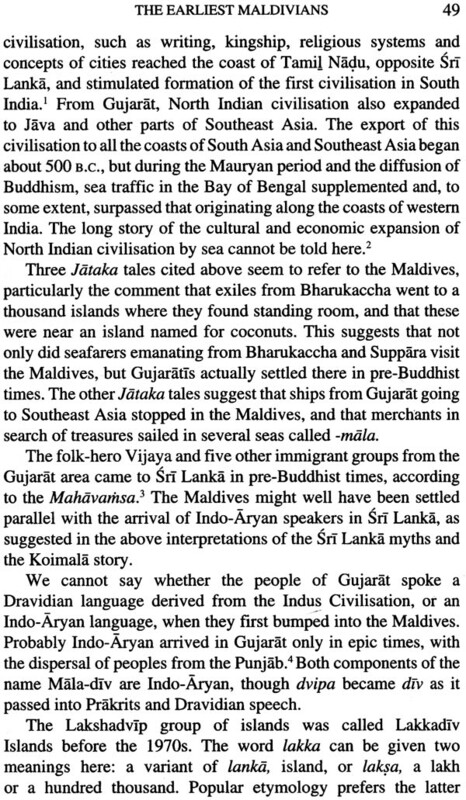 Before, it was not well known that North Indian civilisation from Gujarat reached the Tamil Nadu southern coast parallel with its impact on Sri Lanka when the ancestors of the Sinhalas settled thereabout 500 BC. 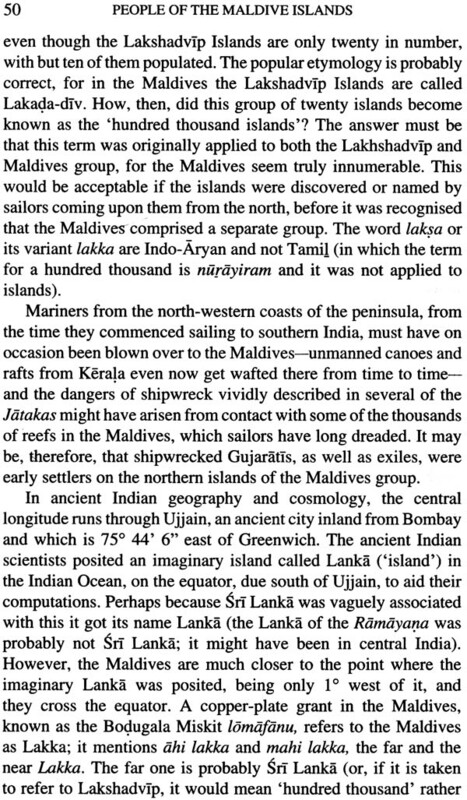 The whole range of northwest Indian kingship, religions, sea trade, militarism, literature, and urbanisation thus reached the far South also touching the Maldives. In Tamil Nadu evolving civilisation retained Tamil, a Dravidian language, but in Sri Lanka the old Western Pali from Gujarat evolved into Sinhala, and also into Dhivehi spoken in the Maldives which is therefore classified as an Indo-Aryan language but with a Dravidian sub-stratum. 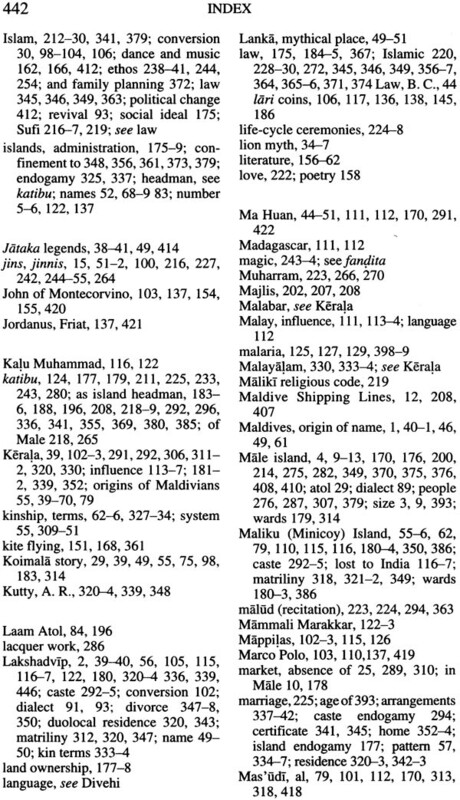 This book has an Appendix quoting a large number of Indian, Greek, Chinese, Arabic, and other ancient and classical sources about the Maldives. Only in the early 1970s did the country open to the outside world, and an airport was built on Hulule island near Male, with flights from Kerala and Sri Lanka. No visa was then required, and I roamed by local boat over the whole country. 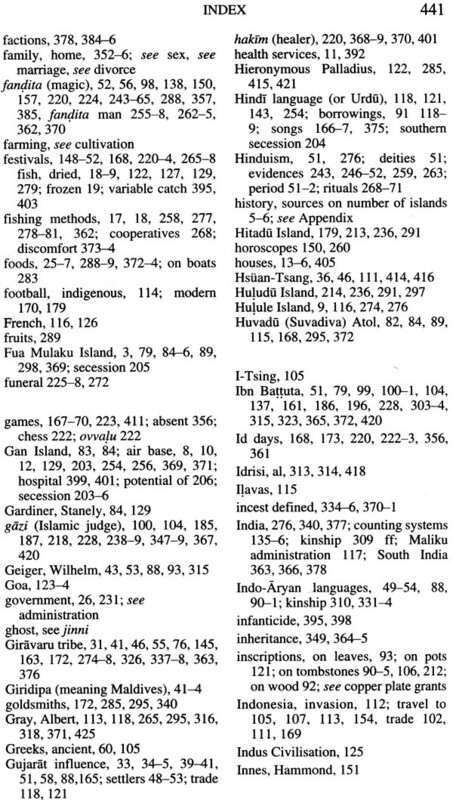 I did not achieve good fluency in Dhivehi, but based on my knowledge of Tamil and other Indian languages, used linguistic evidence extensively in the book. 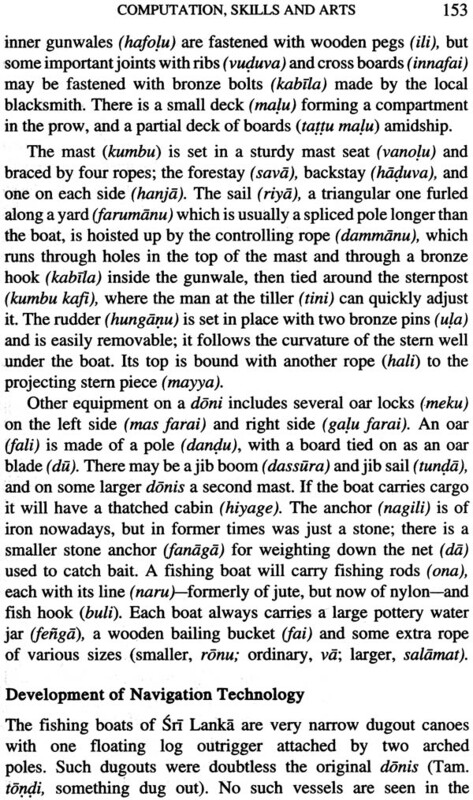 This book uses the Indic system of transliteration with diacritical marks which scholars have long used to represent the phonetics of South Asian languages (line over long vowels, dot under retroflex consonants, etc; see the original Preface, also Chapter 4). 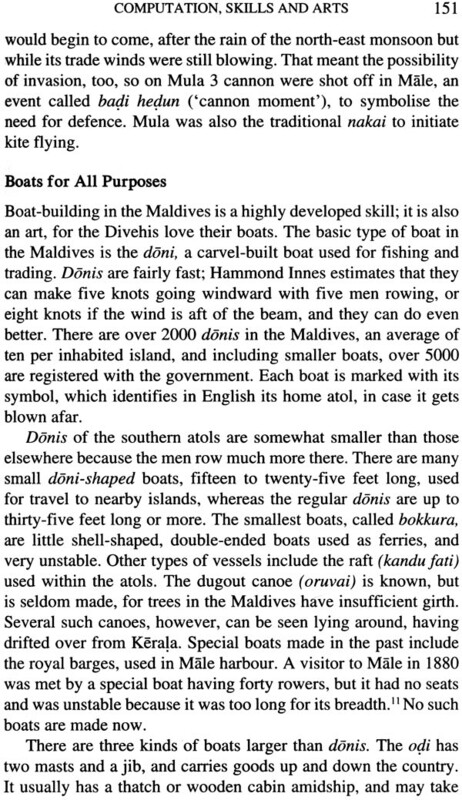 In recent years Maldives has been using another form of transliteration into English; for example, the name of the language now is written as Dhivehi, not Divehi as in this book. 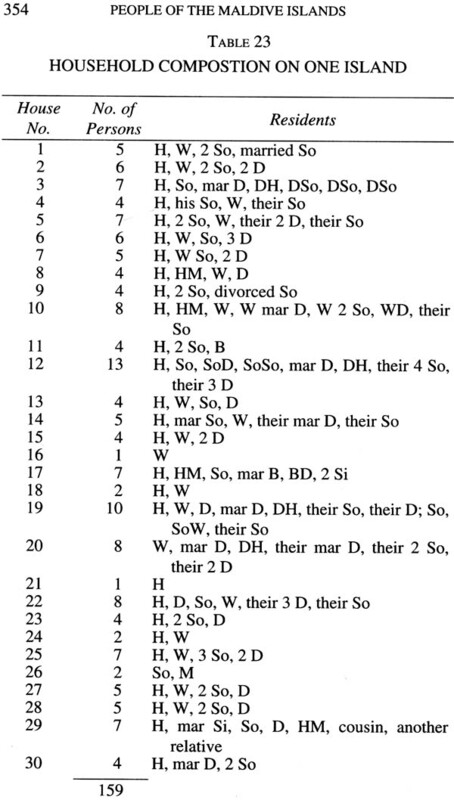 (confusing because in transliteration of most other South Asian languages, an h after a consonant represents the aspirated form, but in Dhivehi there are no aspirated consonants; palatal d and t are distinguished from the dental forms written as dh, and the which is pronounced with the tongue on the teeth, like the difference in English between "thin" and "tin"). 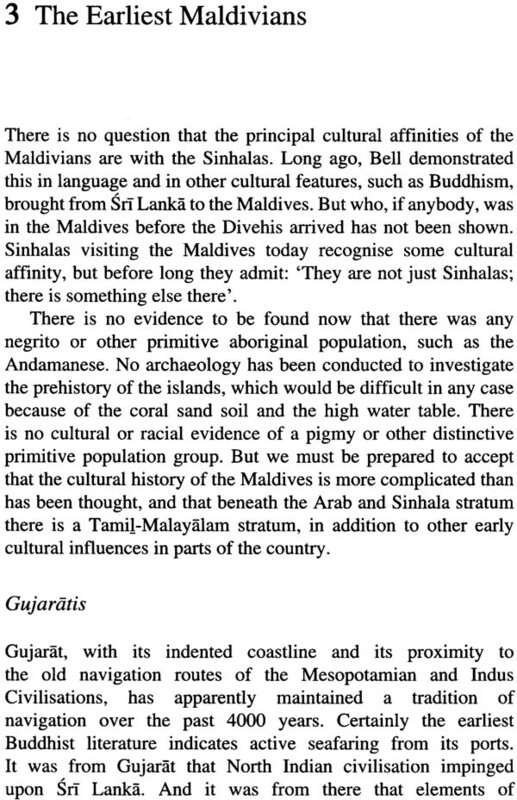 Since the original publication of this book, several social scientists, linguists, and others have written on the Maldives. 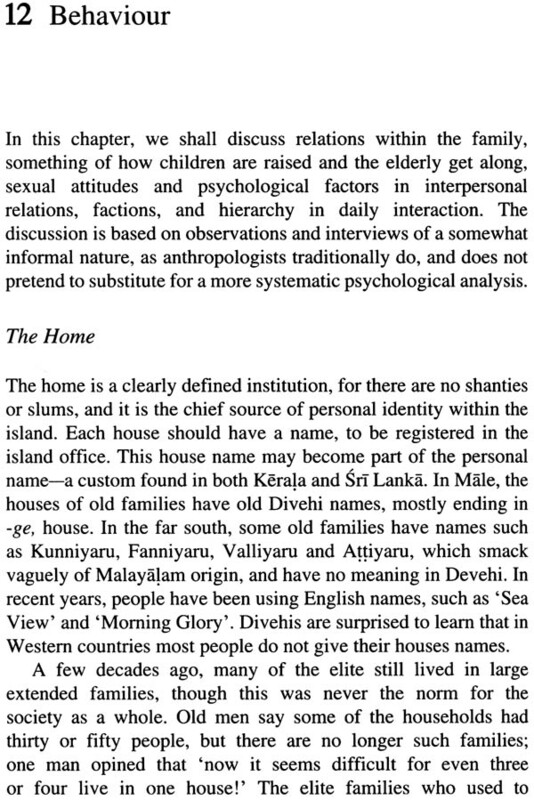 Most important is The Maldive Islanders, by Xavier Romero- Frias, an anthropologist originally from Spain, who lived in the Maldives for twelve years and speaks the language; the book is a treasure of oral traditions and lives of the people. 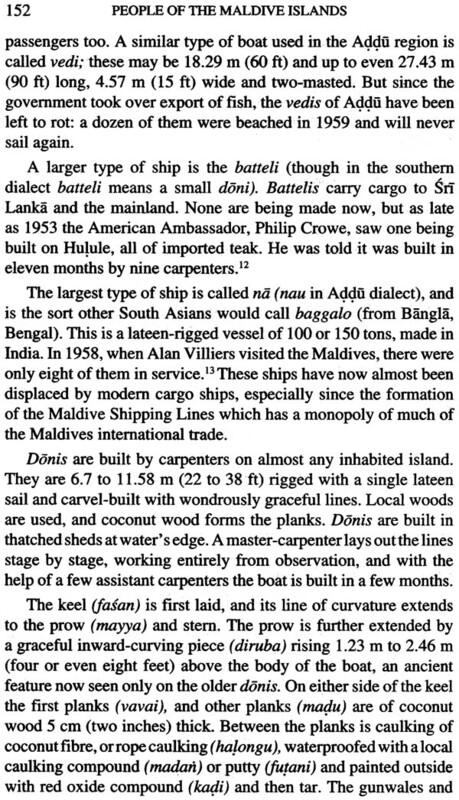 Nils Fin Munch-Petersen, from Denmark, has over decades observed and written about the society and handicrafts of Maldives people, and there are other studies of the language. The Select Supplementary Bibliography at the end of the book cites some important more recent works especially on social, linguistic, and historical topics. 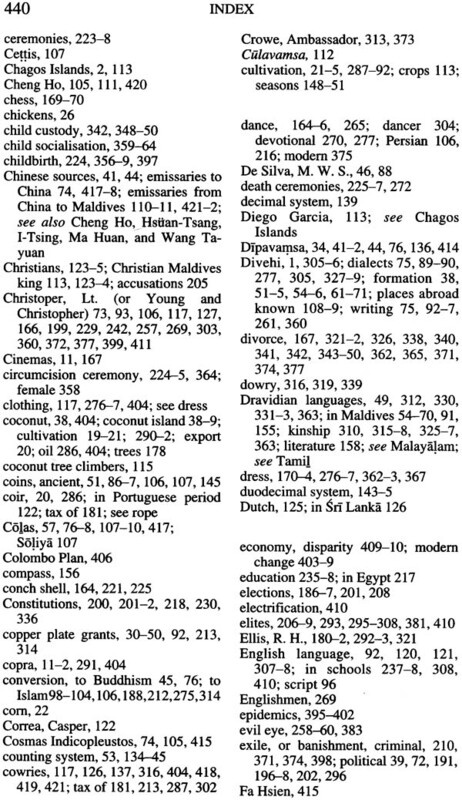 A comprehensive source for news and analysis of recent events, also for history of the Maldives, along with a dictionary, is Maldives Culture, edited/compiled by Michael O'Shea (Australia) and his Maldivian wife Fareesha; some items are from the National Center of Linguistic and Historical Research, Male. Also two newspapers Haveeru Daily, and Minivan News, are available online, and an interesting news- sheet from the exiled Maldives Royal Family now living in New Zealand (see Select Supplementary Bibliography). 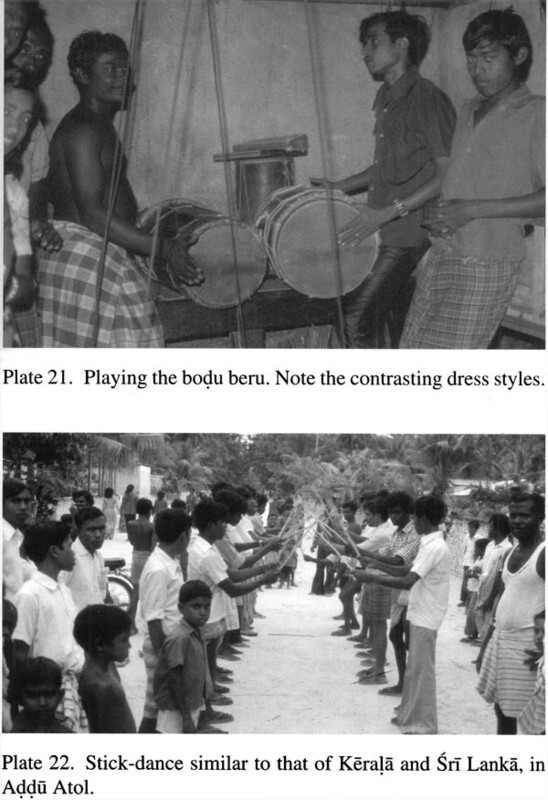 While this reprinted book can give a glimpse of the origins and traditional society of the Maldives people-more important, it provides an example of the basis from which evolved massive changes in just one generation, in society, in human effect on land and sea, and in our unsustainable consumption which will affect the welfare-nay, perhaps even the existence-of much of humanity on this world.